Wed., March 29, 2017, 1:17 p.m.
A few teams have called the Seahawks inquiring about trading for cornerback Richard Sherman, coach Pete Carroll said at the NFL league meetings Wednesday in Phoenix, and the Seahawks have listened. But could the Seahawks actually trade their six-year veteran standout corner? Carroll appeared to rule it out, saying “I don’t see anything happening at all” while possibly not shooting the idea down quite as firmly as some might have expected given Sherman’s on-field value to the Seahawks since joining the team in 2011. Carroll, when asked about the rumors of the team entertaining trade offers for Sherman, began with the caveat that the team will always explore every opportunity while not explicitly saying the team would never think of trading Sherman. But if Carroll appeared to indicate the team won’t actually be trading Sherman, he also made clear the team is hoping that Sherman in 2017 can avoid some of the incidents that marred his 2016 season and helped lead to rumors that Seattle could consider trading Sherman. Sherman’s “issues” last season included two mid-game disagreements with coaches that turned into extensive sideline blowups, publicly questioning a play call from offensive coordinator Darrell Bevell after a game against the Rams in December, as well as a decision late in the season to not talk to certain members of the local media or hold his usual weekly Wednesday press conference. In some of his most candid comments on the topic, Carroll acknowledged that the season was a difficult one for Sherman. “Richard went through a lot last year and most of it self-inflicted,” Carroll said. “He got out there and I think he was in the midst of a season that was really challenging for him. If you remember when he had his issue it was right in the midst of playing some great players week after week after week and he was teed up for it and jacked about it and all of that and he was competing like crazy. ”He’s a fantastic battler. The only thing that happened is that he didn’t come back, he didn’t re-set as he has. He always found his way to reset (in the past) and he kind of stayed on the edge throughout the season, which was very challenging for him. That’s a lot to carry. He’s a very capable guy at dealing with all of the issues that the league brings and offers for guys and he’s a guy that is always going to be out in front, which is where he should be. He’s an extraordinary football player and an exceptional young man. It just was a challenge. Sherman, who turns 29 on Thursday, has two years remaining on a four-year contract signed following the 2014 season which includes salary cap hits of $13.6 million and $13.2 million the next two years. 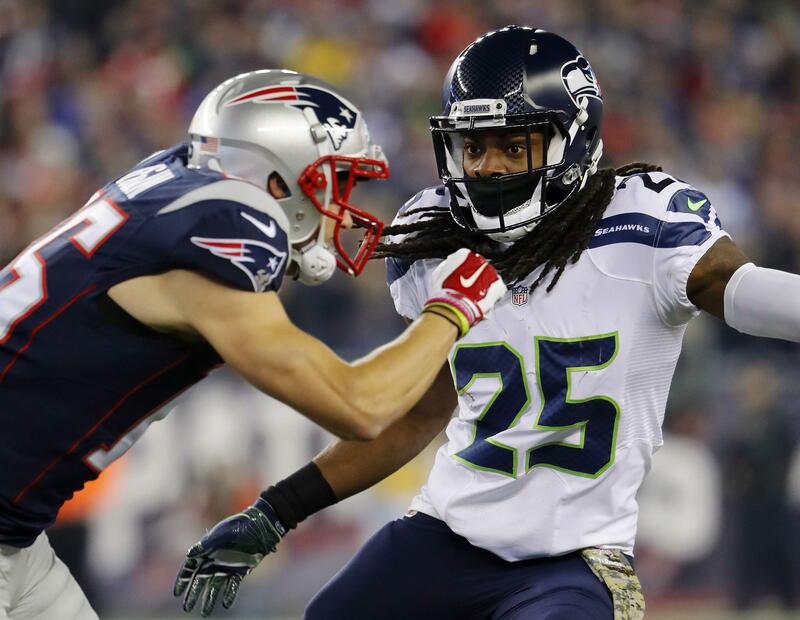 The NFL Network reported that the Patriots were among the teams that inquired about Sherman, though it was unclear what New England offered or how close a trade may have been. Published: March 29, 2017, 1:17 p.m.